If you are looking for new ways to enhance the look, feel, and function of your commercial property, consider adding low maintenance solutions that include professionally designed and installed Rhode Island hardscape construction. Property owners, property managers, municipalities, and designers are investing more in hardscaping construction now than ever to create a great-looking property that requires little to no maintenance throughout the year. The perfect balance of landscaping plant material and hardscaping elements can create a beautiful look that will attract attention to your business property without requiring a lot of extra work from you and your crew. Depending on the style that you choose, your Rhode Island hardscaping project could even add value to the property, not just in the way that visitors and tenants utilize it, but also in actual real estate value. Hardscaping construction is fast-growing as a popular and meaningful way for property owners to maximize their properties, enhance the appearance, and even include more function for customers, tenants, employees, and visitors alike. However, it is important to work with a professional service provider that can provide you with valuable advice and quality hardscaping design in Rhode Island. Eastern Landscaping, Inc. has many years of experience working with our clients to create low maintenance solutions and great looking hardscaping projects designed to enhance and increase the value of their properties. From retaining walls to patio projects, built-in garden seating to fountains, beautiful walkways and everything in between, our team of professional Rhode Island hardscape construction experts can design and install decorative elements for your commercial property that will attract positive attention. Most commercial properties have a lot of open space surrounding the building that is not being used to its full potential. Commercial residential properties, such as apartment or condominium complexes, can benefit from using hardscaping design in Rhode Island to create a park-like setting for residents to enjoy. Patios, picnic areas, playground spaces, dog park areas, beautiful gardens, and walkways can help residents to get even more out of renting at your property, adding value in a whole new way. For office buildings, industrial complexes, and even retail shopping centers, Rhode Island hardscape construction can be used to create places for people to meet, employees to have breaks and lunch, and establish a well-lit and safe perimeter for your commercial property. Low maintenance solutions like these will look great all year-long, whether it is raining, snowing, or 100 degrees in the shade. When designed well and appropriately integrated with existing or newly planted landscaping, these new areas can make the entire property feel more inviting. One of the biggest buzzwords in commercial property management these days is sustainability. When you choose to add Rhode Island hardscape construction to your property, you increase sustainability, reducing water consumption compared to a property that is surrounded by green grass and by selecting environmentally-friendly designs and materials. Natural flagstone and manmade permeable pavers are excellent choices for walkways and patio areas, allowing the water to run off naturally into the surrounding soil to nourish all of the plants, shrubs, and trees. This also reduces the amount of fertilizer and herbicide that will be required to maintain a beautiful commercial property. Low maintenance solutions mean fewer man hours needed to keep everything looking clean and professional. It also reduces your carbon footprint, as it won’t require the use of gas-guzzling lawn mowers, weed whackers, trimmers, and blowers to maintain it throughout the seasons. When designed with sustainability in mind, you can create a genuinely earth-friendly environment that all of your guests will enjoy. If you are interested in learning more about how Rhode Island hardscape construction can make improvements to your commercial property across the board, give Eastern Landscaping, Inc. a call at 401-766-9035. Our team of highly trained, experienced, and knowledgeable technicians will provide you with a FREE assessment of your existing property and help you achieve all of your low maintenance solutions and hardscaping construction goals. 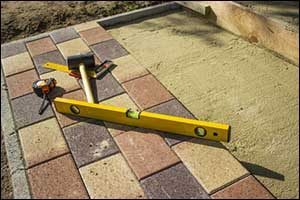 In addition to providing professional hardscaping design in Rhode Island, we also have all of the equipment, skills, and experience necessary to correctly install and maintain your new hardscaping construction features. Call today for a free NO COST estimate and start making plans for your new Rhode Island hardscaping project.